Get some Mens Gold Plated Coronet Prince of Wales Spurs and other Mens Boot Spurs today made of unmatchable craftsmanship. 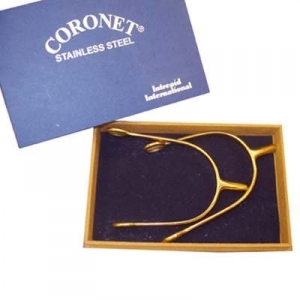 If you've been looking for Gold Plated Coronet Prince of Wales Spurs you came to the right place. This specific model of Prince of Wales Spurs happens to be one of our best sellers due to it's impeccable craftsmanship and affordable pricing. These Mens Boot Spurs are a very luxurious pair which will make you stand out from the rest. These spurs also come with a lovely Coronet Box and measure 3/4" in the neck. Finding the perfect pair of boot spurs for men can be very hectic and time consuming. This is why we strive to offer only exceptional quality mens spurs that we believe are made of unsurpassable craftsmanship.